Castle Rock Town Hall is located at 100 Wilcox Street, Castle Rock, CO 80104; phone: 303-660-1367. Photo: Benjamin Hammar House, 203 Cantril St., Castle Rock, Colorado; ca, 1887, built of native Douglas County rhyolite stone; listed on the National Register of Historic Places in 1993; photographed by user:Smallbones, 2010, en.wikipedia.org, accessed September, 2012. In 1869, Jeremiah M. Gould claimed a 160-acre tract on what is today Castle Rock. Later John H. Craig and Philip P. Wilcox added on to the town. J.D. McIntyre, Deputy Surveyor for Douglas County, was commissioned to draft a townsite plat which was filed in April, 1874. Castle Rock was also named the Douglas County seat that same year. The beginnings of the rhyolite stone industry in the area is credited to Silas W. Madge, a rancher who first promoted local stone as a excellent building material. This discovery brought an economic boost to a predominantly agricultural area. Three quarries flourished as the Denver Rio Grande connected Castle Rock to Denver and Colorado Springs in 1872. Lines were added to transport the rhyolite directly from the quarries to cities using the stone. 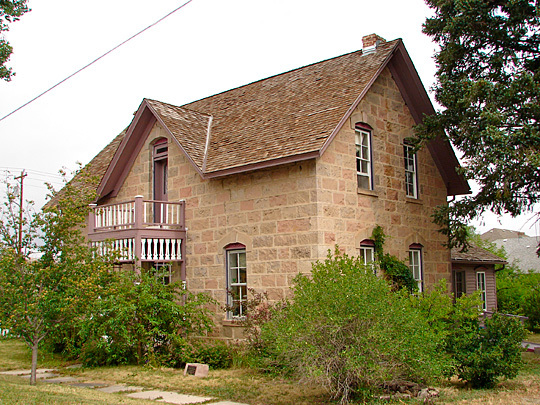 During the mid 1870's through the 1880's Castle Rock continued to grow, building churches, schools, roads, and many residences out of native wood and stone. Another important industry joined the early entrepreneurs, the Castle Rock "O.K." cheese factory. The town water works system and abundance of pure drinking water was a source of community pride as was the landscaping of the town center with cottonwood trees implemented during this time. In 1890, the new Courthouse was completed in the town square at 3rd Street and Wilcox and Wilcox Street became the primary central business district, supplanting Front Street along the Denver and Rio Grande Railroad. The Silver Panic of 1893 stalled Castle Rock's growth for several years, but the local economy rebounded with a "boomlette" that lasted from 1897 to 1900. An excerpt from the Castle Rock Journal, December 21, 1900, describes the town's setting for newcomers as "one of the most favored residence towns in Colorado" with an unsurpassed climate and the highest record for health. "Typhoid fever, diphtheria and other diseases resulting from sanitary evils are almost unknown here." The access to railways was another obvious draw, with twenty-six passenger trains passing through the town in each direction. As well, the town boasted it relationship to larger towns: "as it is only an hour's ride to Denver the resident here can almost enjoy the title of suburban resident of the metropolis." The town's most outstanding structures were the courthouse and the public school, both recently constructed of local "lava stone."